Hair line - fine scratches on a plate or cylinder which print in the colour of the ink employed. 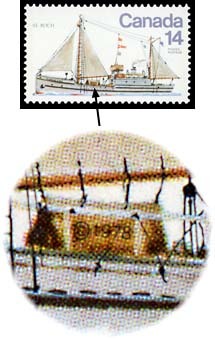 Hand-stamp - postmark (cancellation) or overprint applied by hand to a cover or to an adhesive stamp. Such a marking is said to be 'hand-struck'. Harrison - manufacturer of paper used on Elizabethan-era stamps. First seen in August 1983. The gum has a blue-green tinge and the paper curls. Harrow perf - both vertical and horizontal perforations done on a whole sheet of stamps in one pressure or operation, as opposed to the piecemeal methods of line and 'comb'. 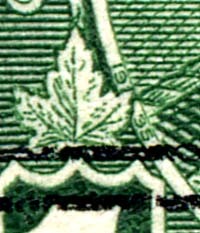 'Hidden' date - small year date 'hidden' in the design of Canadian stamps indicating the year of printing (or copyright of design). Most Canadian stamps since 1935 have a "hidden date" (the first being the King George V Pictorial Issue of 1935). A couple of more recent issues have the "hidden date" incorporated into the tagging (an example is Scott 2003, the $1.25 Riopelle souvenir sheet issued in 2003). Hinge - stamp hinges are round-cornered oblong pieces of tough, thin paper, gummed on one side and designed for the neat mounting of stamps in the album. Horiz. Horizontal. As opposed to vert., the vertical or upright, when describing the format of a stamp.